Whether it's the parrot-fish perspectives or that ageless feeling of discovery, anchoring off isolated islands and remote reefs, we'd usually agree that the best way to explore the Seychelles is from the deck of a yacht. However, our guest helicopter flight has us thinking otherwise. Experience the islands from 1000 feet up for a new sense of the Seychelles, where the greens are greener, the ocean is a whole new palette of blues, and spotting the perfect empty beach from the air is the high life as it's meant to be. 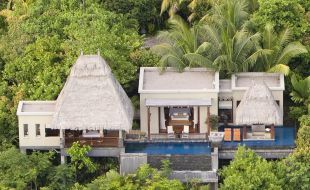 MAIA guests staying four or more nights can now enjoy a 15 minute complimentary aerial tour of Mahé in the class-leading quiet of one of Zil Air's luxury helicopter fleet. Alternatively, if you'd rather see more of the island from closer to sea level, we can arrange a complimentary chauffeur driven island exploration tour of our favourite Mahé highlights.